Nursing was such a blessing. Working with kids, families, and great nurses really helped to shape me into the person I am today. It was also eye opening as far as learning, watching and growing from a single person to a parent. And with over 6 years experience, I definitely learned a thing or two about being a mom. Some funny, some serious, all real! The #1 reason why kids were in the hospital is from folks not washing their hands. Seriously, this is the easiest and most preventable way of NOT landing yourself with a big hospital bill. If anything, nursing taught me to be really neurotic when it comes to hand washing. I am proud to say that my son is pretty neurotic now too (ahhh, parenting skills). I now find myself searching for that foam instant sanitizer outside of the kids rooms. Once I figure out how to make it look appealing (maybe future DIY), I’m so installing some! I think one of the hardest things for me as a new parent (and a nurse) was realizing that I had to change diapers…a lot of them. In the hospital, you just grab a pair of gloves, diaper and wipes and never think twice about it. At home…well it was a shocker. I have to touch my kids’ bottom…with my hands? I found myself wondering where the box of gloves was….diapers cost how much?…how come wipes don’t come with a warning “You’re-down-to-the-last-few-dummy”? This definitely made me more grateful of neurotic reason #1 above. 3. It’s Gross, But I’ve Seen Worse. Take any gross bodily fluid scenario…yeah. I’ve seen worse. Nursing has definitely given me a strong stomach and a lot of mental pictures. So no matter what sickness my kids throw at me…yeah, I definitely have seen worse. If anything, I definitely have something to compare to now. 5. Get My Act Together! I am stronger than I look. I can endure quite a bit of stress. I can get my act together and be the mom I am supposed to be. Anyone who’s a nurse, I bet you’ve checked out your kids veins. I know as I sat there breastfeeding, I studied each of my kids hands and arms, knowing where I would want my nurse to start their IVs, draw blood, etc. Any sort of harmful procedure, I had a back up plan and a least traumatic route (thanks Child Life) to make sure my kids were as safe and protected as possible. Yes, nursing definitely made me a Mother Bear, but it could mean a difference in 1 blood draw versus multiple. …or when was the last time??? 8. Children want their parents more than anyone when they are sick. When kids are not feeling well, all they want to do is cuddle with the familiar, the safe, the loving. Sometimes it’s hard to put down the nursing diagnoses and critical thinking to just sit and be a mom. 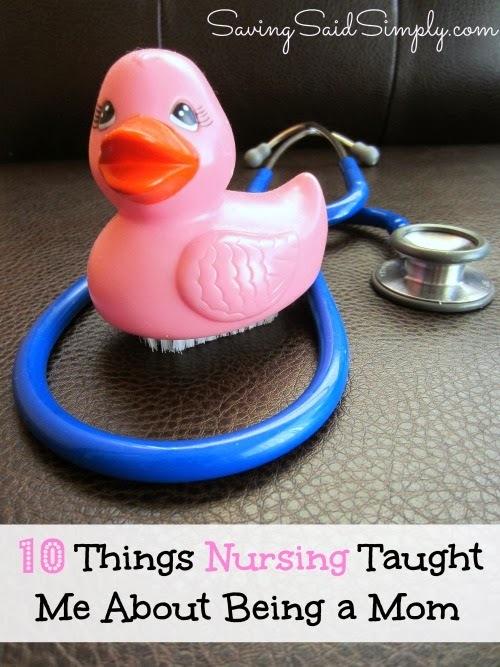 Nursing taught me to appreciate how much kids need a parent’s love to heal and recover. I can’t fix everything, but I can be their mom. As an outsider with a small window into a family’s life, I have seen some extreme dynamics between family members. Lonely, forgotten kids, the “hands-off” parents, and the princesses that have their parents wrapped around their fingers, even depressed relationships. Nursing has definitely taught me who I DON’T want to be as parent. I strive hard to have a balanced parent-child relationship, each one just as important, just as amazing, just as loving as the next.I have watched and I have learned. 10. I don’t know it all. Even with all of the experience, I realized that I really DON’T know it all when it comes to being a mommy. Finding my own experiences, my own nuances, my own battles, my own mistakes is really what makes me the parent I am. Nursing definitely has given me a lot of great insight, but seriously, don’t forget to just LIVE. Be a mom. Be with your kids. Love. Have any great parenting tips that you learned from your job?